Sexually transmitted diseases are on the rise in the United States. Chlamydia, gonorrhea and syphilis have all drastically increased. Chlamydia saw a 22 percent increase from 2014 to 2017, gonorrhea rose 67 percent, and syphilis 76 percent. 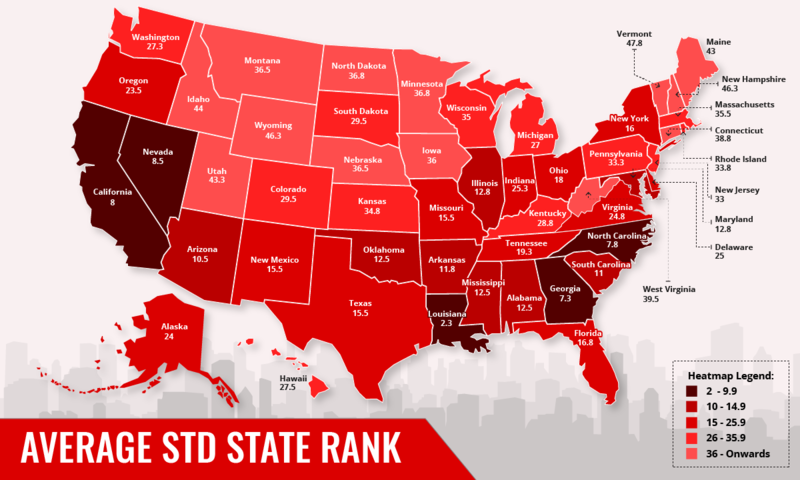 We wanted to know which states had the highest rates of each of the STDs. Data was pulled from the most recent STD Surveillance Report done in 2017 by the Centers for Disease Control and Prevention. The CDC's surveillance report gathers its information from various sources including state and local STD programs and surveillance networks. We selected the four most commonly diagnosed sexually transmitted diseases the CDC monitors which are: gonorrhea, chlamydia, primary and secondary syphilis, and congenital syphilis. Congenital syphilis is diagnosed in infants when a pregnant mother passes syphilis to her baby. We looked at cases, populations, and rankings for all four infections in all 50 states. Chlamydia is the most commonly diagnosed sexually transmitted disease in the United States. It is a bacterial infection known as the silent epidemic for women since symptoms don't manifest in many cases for several months and can lead to fertility problems. 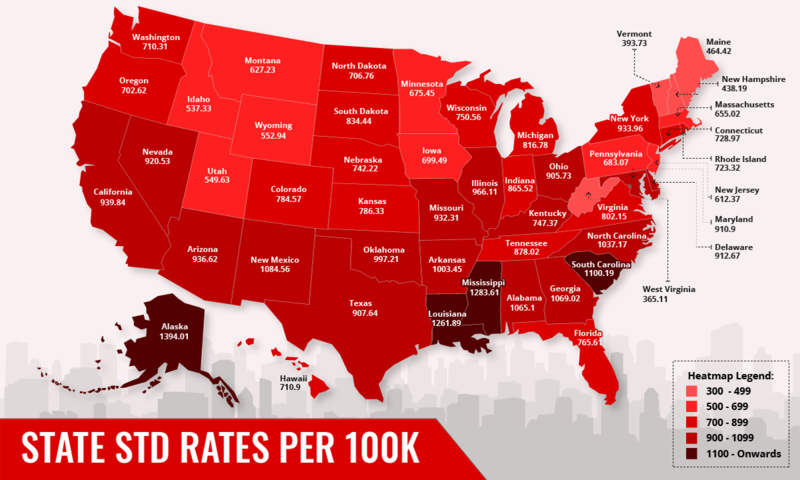 Since states with the highest populations have the most cases, we figured the infection rate per 100,000 people. Gonorrhea is an infection caused by the bacterium Neisseria gonorrhoeae. The CDC is particularly concerned with gonorrhea, as the strain has become antibiotic resistant and doctors are running out of ways to treat it. Syphilis is a deadly bacterial infection with four stages: primary, secondary, latent, and tertiary. The CDC's numbers focus on primary and secondary infections, as most patients in the United States are treated before it reaches the final two stages. In the early 2000s, it reached historically low levels and there were hopes the disease would be eradicated. However, it has consistently risen since then. Congenital syphilis is a truly tragic and heartbreaking illness. It is syphilis that is passed from mother to infant. The disease has seen a 154 percent increase since 2013. Nearly half of all children infected while in the womb do not survive. The U.S. Preventive Services Taskforce now recommends all pregnant mothers are tested for syphilis at their first prenatal screening. Antibiotics can prevent the mother from passing the disease on to their newborn. The Centers for Disease Control and Prevention is fighting an uphill battle trying to get STD rates back down to where they were in the early 2000s. Last year, the CDC announced $92.5 million in grants were available for state and city health departments to strengthen STD prevention and control programs. The money can be used to conduct STD surveillance, respond to outbreaks and promote CDC recommended awareness campaigns, screening, diagnosis and treatment. Money was given to communities in all 50 states as well as Puerto Rico and the Virgin Islands. To find a state's overall score, we took an average of their rankings. The lower the score the higher rate of STDs in that state. States with the highest rate of STDs are Louisiana (2.3), Georgia (7.3), North Carolina (7.8), California (8.0) and Nevada (8.5). Vermont has the lowest score of 47.8, followed by Wyoming and New Hampshire at 46.3, Idaho at 44 and Utah at 43.3. While Alaska has high rankings per capita with gonorrhea and chlamydia, it has extremely low syphilis rankings and no cases of congenital syphilis, bringing its score down to 24. Data was pulled from the 2017 STD Surveillance Report done by the Centers for Disease Control and Prevention. Since population density affects the number of cases in each state, case numbers were put through a per capita equation to represent the number of cases per 100,000. The overall rankings were figured by taking an average of a state’s individual rankings for gonorrhea, chlamydia, primary and secondary syphilis and congenital syphilis. Congenital syphilis is when the disease is passed from mother to infant but is still considered an STD by the CDC. Congenital syphilis was omitted when figuring the percentages of each state's population with STDs. The CDC draws its data from three sources: notifiable disease reporting from state and local STD programs, projects that monitor STD positivity and prevalence and national surveys and other data collection systems implemented by federal and private organizations. A new STD Surveillance Report should come out this year to show statistics for 2018.